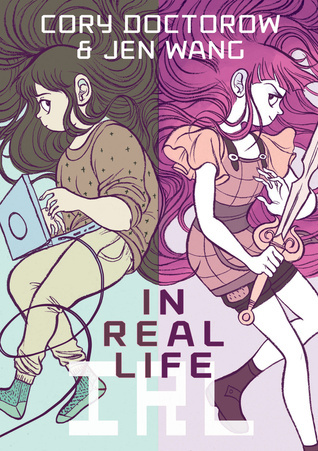 Anda is a gamer, and she gets invited to join a game called Coarsegold Online by a woman who comes to talk to her computer class at school. She gets told that she won’t have to pretend to be a boy in the game because there is an all girl group in this game. Everything is great, until she’s told she needs to go and kill some gold-farmers, because they’re just mooching off the system. So she goes, but she finds that they don’t fight back, but she goes through with the orders anyway. Later, she meets a gold-farmer who speaks English and talks back to her about what’s happening. She befriends him against her leader’s wishes. The artwork is literally everything I’ve ever wanted from a graphic novel. It’s kind of like watercolor, and the colors are so vibrant and beautiful. It’s pretty much all pastels and very saturated color; I highly recommend reading it just for the fact that the art is GORGEOUS. I’d say that the story is a pretty solid 3/5 stars, but the artwork sold me. Oh my gosh I’m in love. I think the message was good, and this would be good for any gamer girls who just feel out of place in the male dominated gaming world. I am personally not a gamer, but I could still relate to this. I’ve been really getting into graphic novels/comics recently and would LOVE some recommendations. The library in my town for college is amazing and has tons of different options. Please, please, please give me some graphic novel/comic/manga recs!